Above: Hurricane Irma spins across the Atlantic. Image from here. In light of the news this morning, I thought it best to interrupt our Kilimanjaro story to contemplate something more pressing. Damage in Puerto Rico. Image from here. On my computer screen I see images of a epic storm. Some say Irma is the most powerful hurricane to whirl out of the Atlantic Ocean in recorded history. I am unable to judge this, but even a cursory glance at a satellite photo reveals that Irma is twice as wide as the entire Florida peninsula. A headline from the online version of The Atlantic describes it as "a lawnmower from the sky" (link here). 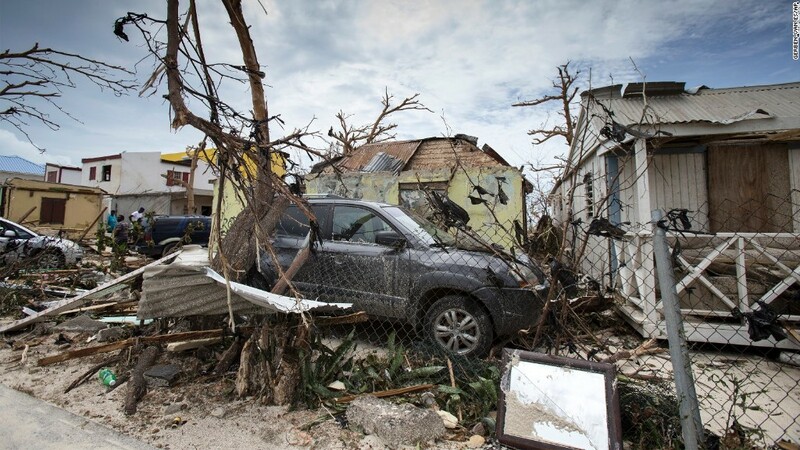 Many have already suffered loss of life and possessions. Many more, and not a few very dear to my heart, lie directly in Irma’s path. All of Florida is a target. Image from here. Under the circumstances, it might be appropriate to consider a few words from Psalm 55. The colophon suggests this is one of the psalms of King David, written in a dark time in his life. I sit at my dining table and read it afresh this morning. I think of many who will bend low over the course of the next 48 hours. I invite you to read portions of it with me (pardon my rather free translation) and think about them. The author of Psalm 55 has the sense of being crushed by the anger/oppression/wickedness of an enemy. In response, he cries out to God. "Listen to my prayer, O God! Do not hide from my request." A child plays in a Hatian slum in advance of Hurricane Irma. Image from here. Such is the timeless plea of the hurting. In the darkness we fear is that God is not listening, that He is not around, or He has better things to do. Such requests are born in our humanity. Everyone we know lapses into inattention. Everyone we know runs off at the wrong time. Everyone we know goes back on their promises. Because we have no models for absolute faithfulness we are haunted by the possibility of dying--or, what's worse, even living--utterly alone and forgotten. Our fear that the God of the Universe will behave just like we do. And so the psalmist prays for Presence. Then she describes how that fear feels. "My heart thumps on the inside; Death-terror falls on me. Fear and churning seize me; I tremble, capsized by horror." The verbs mustered here are powerful: thumping, falling, trembling, shaking, flipping. It is seizure-like; it is total disorientation. 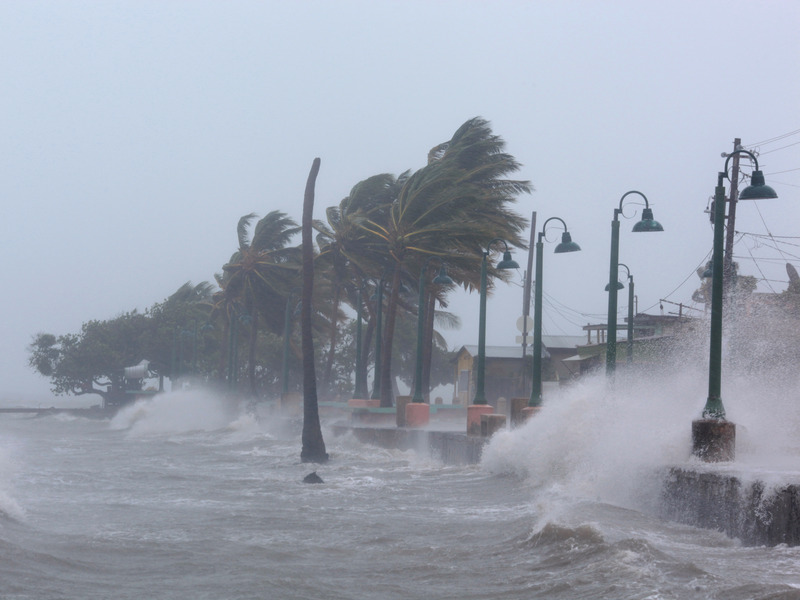 Waves crash against the seawall in Puerto Rico on Wednesday as Hurricane Irma slams across islands in the northern Caribbean. REUTERS/Alvin Baez. Image from here. Anyone who has played on the edge of the ocean knows what happens when you are hit unexpectedly by a rogue wave. The force of the collision takes away your breath . . . and then it takes your legs. You tumble. Down. Up. Down. Up. Down. The lack of air, the lack of direction, the feeling of helplessness in the grip of something beyond yourself is suffocating. You don't plan it. You never do. You simply tumble into panic. And wish to be somewhere else. "I ask, ‘Who will give me wings like a dove! Let me fly away, let me settle down! Really!--I would flee to a far-away place; I would even camp in the desert (selah). I would hurry to find shelter from the raging wind and hurricane.'" Highways are jammed as at least 1.3 million Floridians are under mandatory evacuation orders ahead of Irma. Image from here. The wish to be somewhere else is understandable, yet complicated. Oddly enough, the place where we are can be a spot that we ourselves have chosen or created. Circumstances arise and turn that place into something we never expected, but oftentimes a part of our pain grows from the realization that our present situation is the result of a team effort, and we are a part of that team! This doesn't lessen our desire to find a new place, even at the cost of inconvenience or more pain. "Camping in the desert" would probably not be the first choice for most folk, and yet in the moment, anything would seem to be an improvement. The place where we are is a place of "raging wind." The wind (Heb. ruah) we know; the rage (Heb. sa'ah) is unfamiliar. Arabic and Syriac cognates suggest a ferocious attacker. Bottom line: this is storm beyond our experience. It is chaos unrecorded in our memory. The uncertainty adds to the terror. The wind we know. The rage we do not know. Image from here. The author of Psalm 55 goes on to explain his own sense of loss and betrayal. Several verses in the heart of the poem paint this image. However, by the end, an imperative signals a conclusion that we all need to heed. "Throw in with YHWH; he will prop you up. "Roll down the road with God. Trust Him. He will act." Or, as our text puts it, troubles may "drop" (Heb yamitu, 55:3), but the God-fearer need not do the same (Heb mut, 55:22). 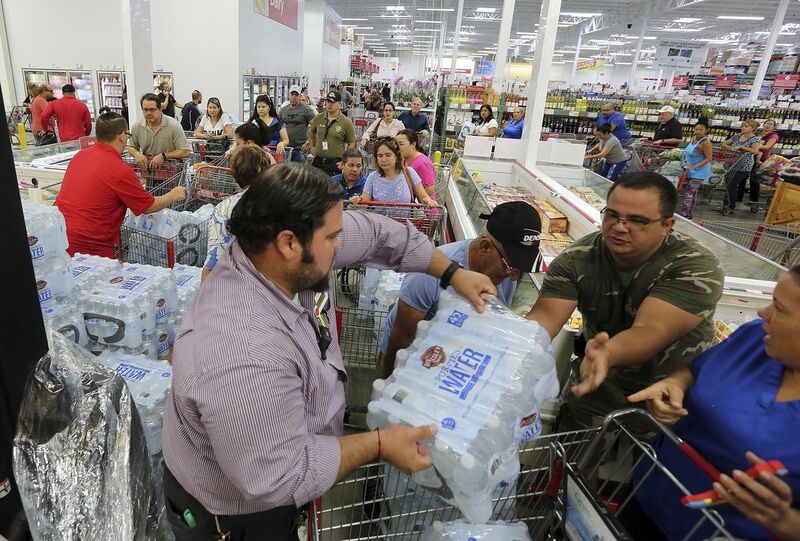 Residents purchase water in Miami. Image from here. Our prayers are lifted up on your behalf, Florida friends. Know that you are not alone. God is here. May He prop you up in the coming storm!